Update from my house. I haven’t done any crafting this week at all. I’ve been sorting boxes. Yes, mostly dull work. But a few surprises. But, on the other hand, I posted some great vintage photos to Facebook for my extended family to enjoy. 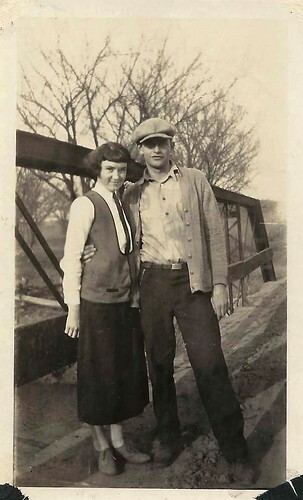 Like this one of my grandmother and her highschool boyfriend. Grandma was born in 1904 so this is 1920-ish. My Dad told me someone dared the boy to walk the top of the bridge, but he wouldn’t do it. But Grandma did. WTG, Grandma! This is a very busy time of year for me. We do a lot of Christmas prep in October and November, as we have our annual Christmas Open House on the first Sunday in December. I have at least thirty kinds of cookies and candies to make. Most can be done ahead and frozen. I’ve been doing some of that this week. I made three kinds of cookies for the freezer in preparation for the open house. 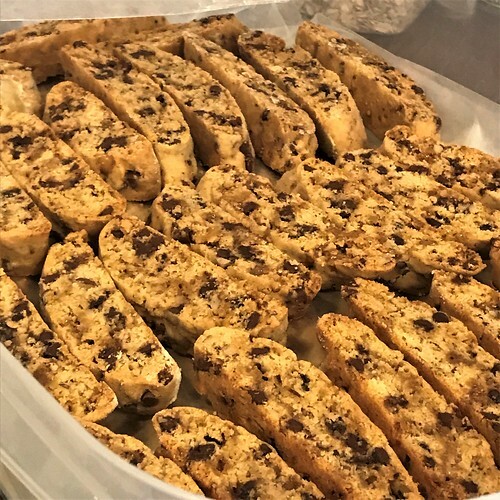 Toffee Bar Crunch Biscotti I plan to dip the bottoms of these into some good quality chocolate the day before our open house. 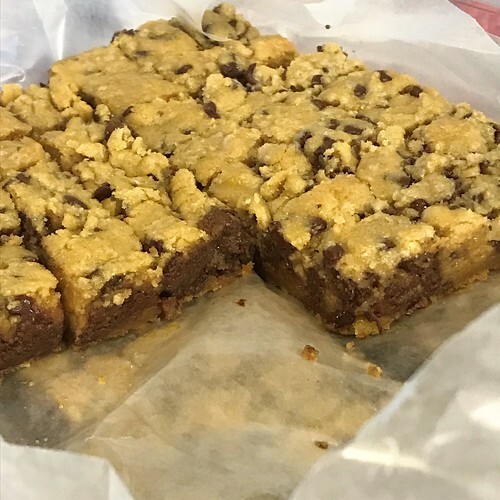 Daniel’s Cookie Bar Bites These 1″ squares will be dipped in chocolate the day before the party. 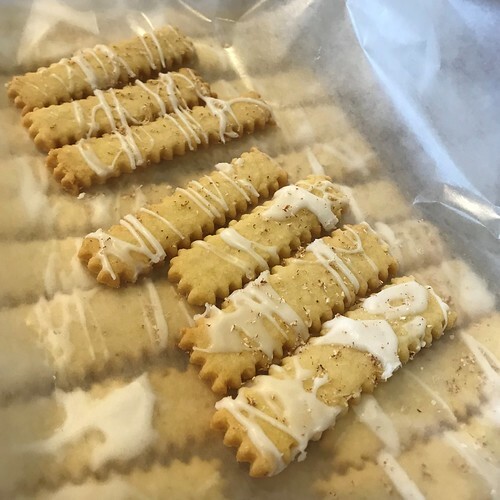 Nutmeg Logs These are done and only require thawing before the party in December. I have finally reached the point (read “age!”) where paring down really does sound like a good idea. Last week, Genny, my BFF Marsha, and I sorted 34 boxes of Christmas decorations. Emptied fifteen. Have about ten that are pending until Christmas decorating is done. If the contents aren’t used to decorate this year, they will be donated, too. That leaves about 100 boxes of decorations still to sort, but a lot of that will be done as we decorate this year. My sister will be here again this weekend to help with our Christmas prep schedule, so I won’t be crafting again until Monday. I have a custom order to finish which I can’t reveal until after Christmas, as it is a gift for the daughter of one of my friends. We don’t want to ruin the surprise! Genny and I may begin the work on this year’s Chalkboard Christmas Tree. 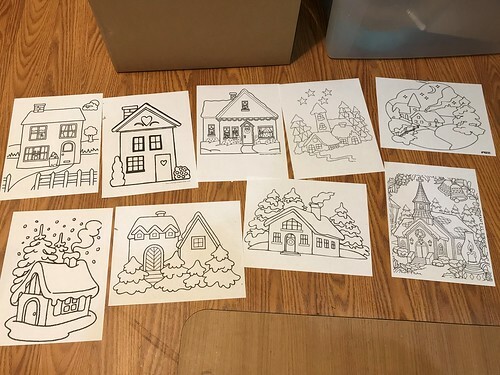 The theme is ready, the picture patterns are printed and edited, and I’m excited to get started! 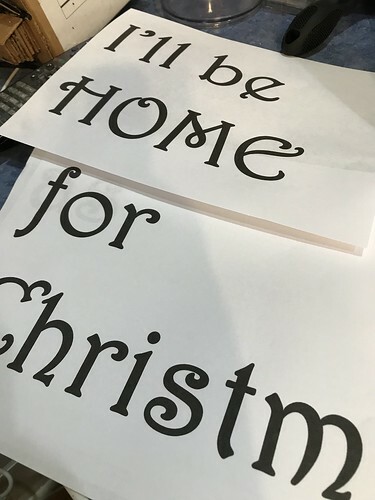 The theme is “I’ll be Home for Christmas.” I’ve printed fifteen little houses, but won’t need that many. 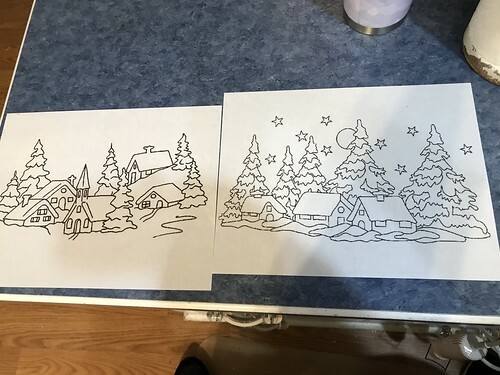 As we design the layout of the tree, we’ll decide which ones will make the cut. This will be chalked over the top of the tree. 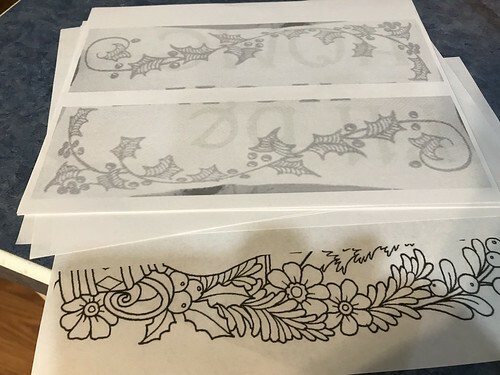 I’m thinking of making the Christmas tree branches from one of these designs…holly branches or garlands. The holly branches would be easier…we shall see! Also cats ‘neath the tree, as well, as we try to include a couple of our fur-buddies on the chalkboard tree. You will find links to the past six years of trees here: Chalkboard Christmas Trees. Back to the last box…wish us well as we tackle some Christmas preparations this weekend! This entry was written by ~~Rhonda, posted on October 5, 2018 at 5:08 pm, filed under Christmas. Bookmark the permalink. Follow any comments here with the RSS feed for this post. Post a comment or leave a trackback: Trackback URL. Can’t wait to see pictures of your beautiful trees!